Aerial view of the turf-ground football stadium being developed in B.Eydhafushi. Eydhafushi, Baa Atoll unveiled the island's recently established top-class turf football grounds on Saturday. 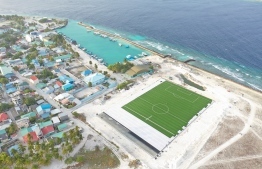 The new football pitch is intended to provide a proper facility for the further enrichment of Eydhafushi's rich footballing history; one that has produced the majority of Maldives’ most skilful football players. 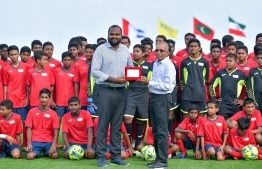 The turf grounds were inaugurated with a special football match between a local Eydhafushi team and the Football Association of Maldives (FAM)'s team. The highly competitive match was won by FAM over Eydhafushi Team with the final score at 6-2, with praiseworthy performances from both teams. 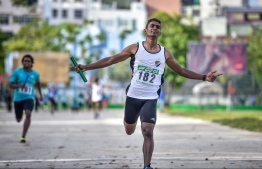 The pitch was made a reality by the well-known businessman, Ahmed Nazeer, following a made pledge to establish the grounds, resulting in the amount of expenditure made for sports in any individual island. Speaking at the inauguration ceremony, Nazeer gave assurances that the grounds would be utilised in the best manner, adding that the turf belonged to the islanders rather than himself. 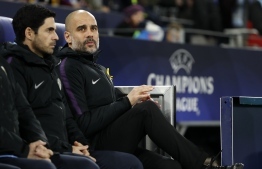 Moreover, he highlighted the work of Ibrahim Amir, who had consulted on the project, compiling blueprints from various football stadiums that further invigorated the work underway. For the memorable match, New Radiant’s Ali Fasir, the player that famously contributed to Maldives' win in last year’s South Asian Football Federation (SAFF) tournament by scoring the second goal against India, wore the captain band for the Eydhafushi team. 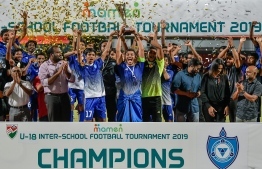 Other notable players in participation were Hamza Mohamed who recently signed to play for Maziya Sports and Recreation Club, TC Sports Club player Ishan Ibrahim, national team veteran Shafiu Ahmed and players for the first division. Ali Ashfag captained the FAM team, scoring two goals, while team members Mohamed Umair, Yasfaadh Habeeb, Ibrahim Waheed and Ashad Ali scored the rest. Furthermore, Acting Youth and Sports Minister Ali Waheed took part in the match, playing for the FAM team in the second half. 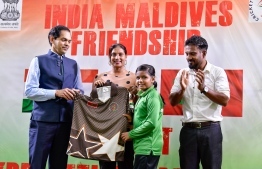 Acting Sports Minister Waheed commended Nazeer for having built the pitch in Eydhafushi, describing the island as a hotspot for fostering football talent comparable to the football grounds of Brazil, a feat no other administration had achieved. 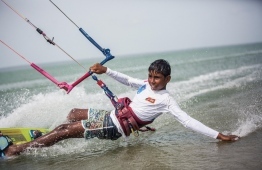 President of Eydhafushi Council Tholal Abdul Rahman stated that the project was the highly anticipated answer to complaints of sports matches taking place on sandy turfs. Thanking Nazeer for the pitch, Tholal described the quality of the facilities as higher than expected. The council president stated his belief that the pitch would take Maldivian football to new levels. The inauguration was attended by prominent Maldivian footballers, both past and present.